Segun Akinlolu also known as Beautiful Nubia is a Nigerian-born songwriter, music composer and band leader. Beautiful Nubia and the Roots Renaissance Band is Nigeria’s foremost contemporary folk and roots music group. Formed and fronted by songwriter and poet Segun Akinlolu (aka Beautiful Nubia), the group’s songs and albums have achieved cult status among their loyal and growing fans spread across the world. Born in Ibadan in 1968, Segun started writing songs at a very young age. He drew his early influence from the traditional culture which was prevalent in the form of oral poetry, theatre, music and folklore. In 1997, he established EniObanke, a music production and marketing company, under which his first album was released in 1997. All subsequent recordings have been released on this label and the company recently commenced the first-ever folk and roots music festival in Nigeria, the EniObanke Music Festival (EMUfest). In 1998, the artist invited several young musicians in Lagos to form a backing band to which he gave the name The Roots Renaissance Band. 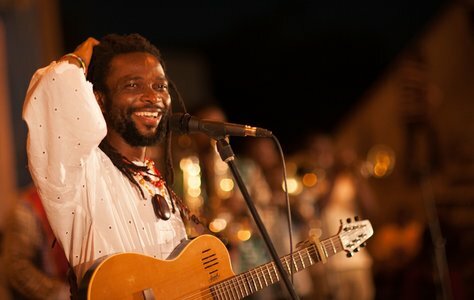 Throughout the years, Beautiful Nubia has remained the songwriter, arranger and bandleader contributing acoustic/rhythm guitar, lead vocals and percussion. The band is still mostly made up of the original members. trampled upon anywhere in the world. A reward came in 2002 with the release of the ground-breaking third album Jangbalajugbu. It is estimated that more than 50 million Nigerians wake up each day to “Owuro L’Ojo (How D’You Do? )”, one of the hit tracks in the album. To date, Jangbalajugbu has sold in excess of a million copies (not including the large numbers sold in the open market by pirates). Since then, the band has released 10 more studio albums, all of which confirm what can be described as the Beautiful Nubia style and his stubborn refusal to be pigeon-holed. The over 200 original songs – didactic, philosophical and deeply moving – have cemented his reputation in Nigeria and beyond as an advocate for employing traditional wisdom in achieving personal and community development and social justice. It is the combination of enjoyable entertainment and provocative thoughtfulness that has come to define Beautiful Nubia’s style. The music has garnered excellent reviews in leading African/world music publications. It has been nominated for music awards and topped international/world charts on community, grassroots and campus radio stations. Segun Akinlolu graduated from the University of Ibadan with a Doctor of Veterinary Medicine (DVM) degree in 1992 and worked as a Vet Doctor for about 8 years. He also holds a Post-Graduate Diploma from the Nigeria Institute of Journalism. You are not particularly linked to any religion. Does that mean you are an atheist? What’s the beauty in the name Beautiful Nubia? been slaves, colonized peoples or second-class citizens of the world. experience enviable growth and progress. Iwa (2016),Taabaku (2016), Odds and Ends (2016), Live in Concert Series II (2016),Soundbender (2015),Keere (2014),Live in Concert Series I (2013),Oriojori-Eternal Spirits (2012),Sun No Dey Sleep (2011),Irinajo (2009),KilòKilò (2007),Fèrè (2006),Awilele (2004),Jangbalajùgbú (2002),Voice From Heaven (1999),Seven Lives (1997).